Apart from leading the Indian football team to victory in the 1962 Asian Cup, Goswami also played 46 domestic matches in the Ranji Trophy. One of the most skillful Indian footballers of all time, Subimal Goswami was a household name in the early 1960s. Except he was popularly known as Chuni Goswami. As a footballer, the high point of Goswami’s career came in 1962 when he led the Indian team to win the Asian Cup. Among the rare few players who play multiple sports, Goswami even went on to play domestic cricket for Bengal in the Ranji Trophy. On his 81st birth anniversary, ThePrint takes a look at the achievements of Goswami. Goswami was born in Kishoreganj district of undivided Bengal (present-day Bangladesh) on 15 January 1938. He completed his college degree from Kumar Ashutosh Institution, Calcutta (Kolkata). He was passionate about football from a very young age. He became a part of the Mohun Bagan junior team in 1946. Later on, he joined the Mohun Bagan senior team in 1954. Goswami played as a striker. In his debut match for Mohun Bagan, he played against Eastern Railways and scored a goal in its 3-0 win. He successfully led Mohun Bagan to three successive Durand Cup triumphs — 1963, 1964, 1965-66. Goswami went on to play for the Mohun Bagan senior team until his retirement in 1968 — he captained the Bengal club for a period of 5 years. He holds the record for maximum number of goals – 145 – in the Kolkata Football League. Goswami successfully captained the Indian team to victory in the 1962 Asian Games. In the semi-final clash against South Vietnam, Chuni netted two goals to help the Indian team reach finals against South Korea. He also made a crucial assist to P.K. Banerjee to give India a 1-0 lead in the finals. Ultimately, with another goal from Jarnail Singh, India registered a historic win by defeating South Korea 2-0. Goswami was duly named the best striker in Asia in 1962. English football club Tottenham Hotspur had reportedly invited Goswami for a trial in England after India won gold in the Asian Cup finals, which he declined. Tottenham was the biggest football club in London at the time and was managed by legendary English football player Bill Nicholson. Football wasn’t the only sport he played. 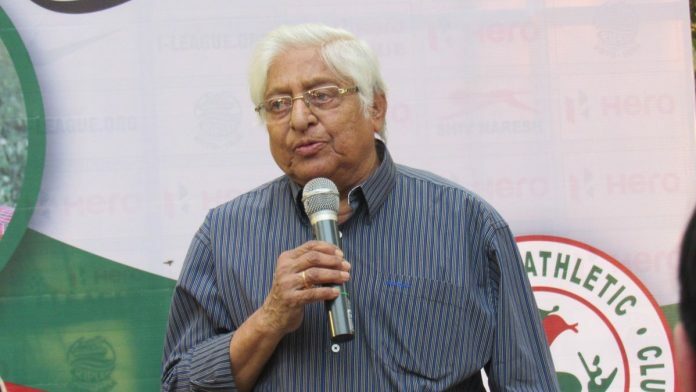 Chuni Goswami had a stint in domestic Indian cricket too. He played first-class cricket for Bengal as an all-rounder between 1962-63 and 1972-73. In his 46-match first class career, Chuni scored 1,592 runs at an average of 28.42, including a century and seven half-centuries. He also bowled at a tight economy rate 2.32 runs per over, with a five-wicket haul to his name. He led Bengal in the 1972 Ranji Trophy finals. Goswami was honoured with the Arjuna Award in 1963, and the Padma Shri in 1983.